My toddler has been loving yoga lately, and he was over the moon excited when he got his own yoga mat for Valentine's Day. Him and my husband do yoga in the morning together and it's about the cutest thing you've ever seen. For awhile now I've been wanting to try the Parent + Toddler class at the Yoga Center for Healthy Living in Brighton. I took their prenatal yoga class when I was pregnant with Max and loved every minute of it. It was a great workout and stretch, and just generally great to chat with other expecting mothers. I always said that I'd try the kids classes once Max was here, but didn't realized how hard it would be since the classes are during the day, and I work. So this past Monday I had the day off and decided to take Max to the Toddler class. I told him that morning we were going to yoga and he kept asking "where's the yoga class mommy?' He was so excited! We bought him the pictured yoga mag for Valentine's Day and he was super excited to bring it along (you can buy it on Amazon here). The class is from 11:40 to 12:40pm, which is perfect for us (on days off) since nap time is around 1:30 these days. You have to pre-book online, but from talking to others in the class, it usually doesn't fill up. The class drop in rate is $15 for both a parent and a toddler, and you pay before the class starts. 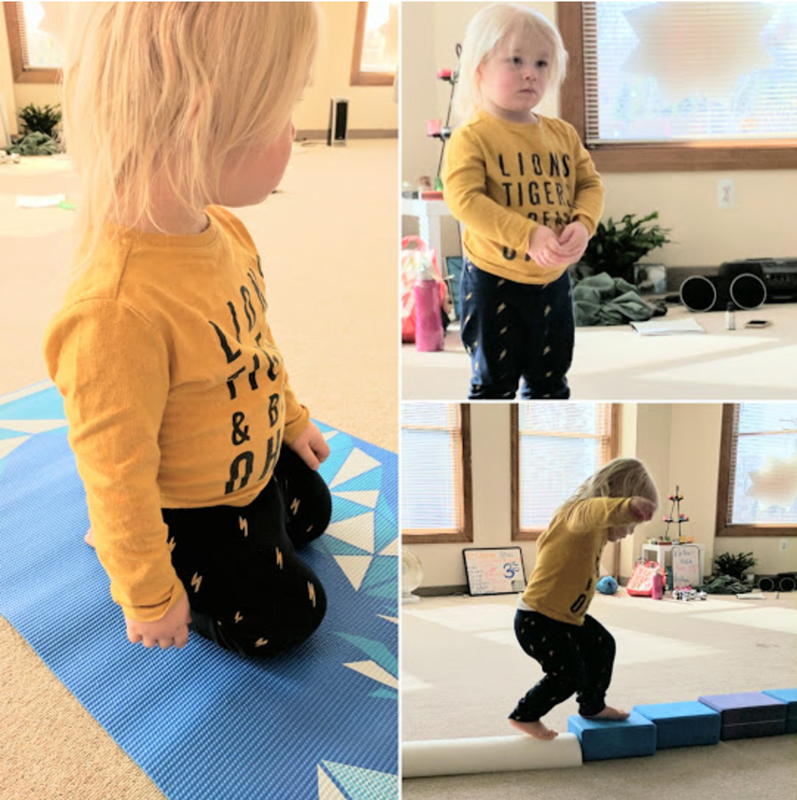 *Toddler and Parent Yoga | As children grow and develop, the need to be active in a fun and safe environment is important. There is no better time than now to introduce toddlers to yoga and enjoy it together. Yoga supports the development of balance and coordination and sets children on a path of healthy living. This fun class is also often the basis for lasting friendships. The instructor started the class off by setting expectations that this is a toddler class, and basically anything goes. This immediately relaxed me knowing that a little toddler fun (or tantrum) frequently happens! The class started off with all the toddlers picking out a little 'buddy,' which was a small stuffed animal. The instructor then had the kids doing fun little moves with the buddies, including balancing them on their heads and shoulders. Max was still warming up during this part of class and didn't participate, but I was surprised by how attentive he still was and just sat there taking it all in. The rest of the class was more active. We played a yoga version of 'Ring Around the Rosie' and set up an obstacle course with yoga blocks and foam rollers. At the end of class we used essential oils for foot and back rubs and had a bit of 'quiet' time (as quiet as toddlers can be). I will definitely go to this class again with Max. I hope next time he's not as hesitant to participate in the first part of class since he'll know what to expect. Have you done yoga with your child before? If so, where at? And how did your little one do? I don't have children, but I have never done yoga ... I've done pilates which I believe is similar though. I think it's neat that Yoga centers are including children. It's such a healthy part of a lifestyle. I wish I never gave it up. Funny thing is I gave it up after my first baby, oops! lol! What a fun class! And a teacher who 'gets' toddlers is necessary in this setting - sounds like they do it right! Oh my gosh, I love this idea. I wish I would have signed up for something like this when my girls were young.